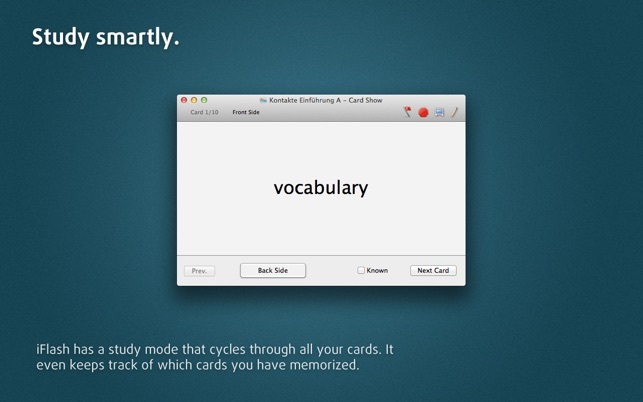 iFlash is an easy to use flash card learning app for the Mac that lets you create and study virtual flash cards. If you want to learn almost anything, from a foreign language to the ten-codes police officers use, iFlash is for you. • Create your own card decks, or download (for free!) 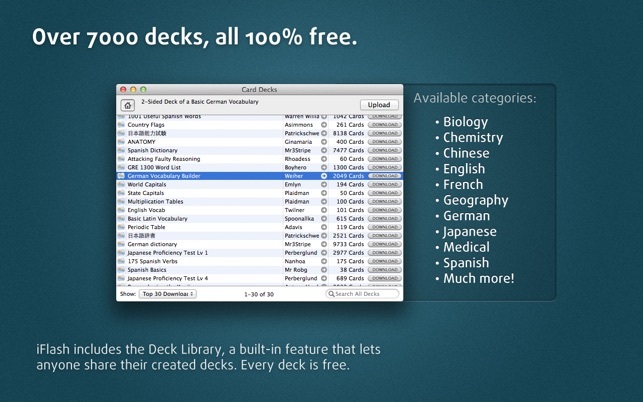 any of the over 7,000 decks available from the built-in Deck Library community. • "Memorization" features let you easily cram for tests, or study longer-term subjects. • Unlimited card sides lets you go beyond the physical limitations of index cards. 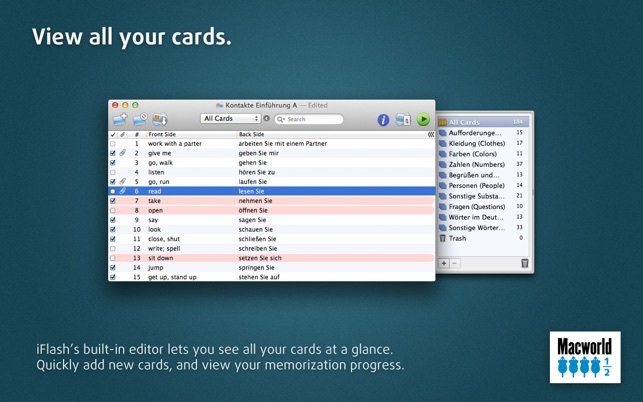 For example, you could have "Word", "Meaning", and "Pronunciation" sides for your cards. 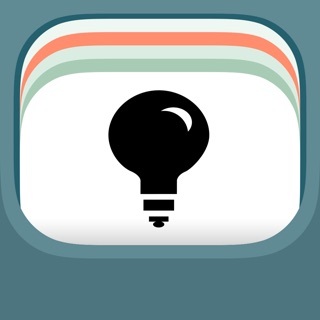 • Study your decks on the go using the free iFlash Touch companion app for iOS. 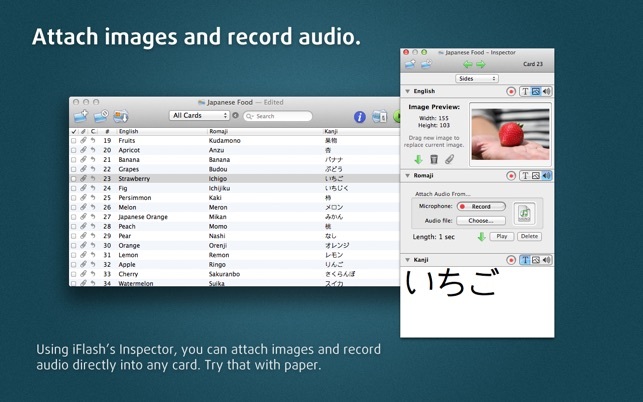 • Add images and audio to any card side. • Keep track of which cards you know with 3 different methods of memorization systems, including an interval method to help learn large amounts of information over time. • Print your cards to 8.5x11 paper. • Import from text files, including CSV files. I wiped my iPhone 6 and restored it, which updated my iOS version to 10.3.2. Now I can’t put any of the flash card decks I’ve created on my phone. The Mac iFlash app recognizes my phone but keeps telling me to open iFlash Touch on the phone when it’s already open. A sign of trouble was when I opened the app for the first time after restoring a warning screen said that the "developer needs to update this app." Yes, I did try deleting the app from my phone and resinstalling. Telling detail: The “Information” summary above shows that the last time the developer updated this app was March 2014. If he gave any hint that he was working on the problem I’d be patient. Apparently he has lost interest in iFlash but is happy to keep it on the Appstore for anyone who happens to buy it, even though it won’t be functional for people running the current and future versions of iOS. I would have rated this product 5 stars back when it worked. But now that I can’t use it on my iPhone, it is unacceptable. I don’t mind so much having to buy a different brand of flash card program. What I mind is that I’ll have to re-create all my flash cards! If you're only using iFlash on a Mac, it's great. 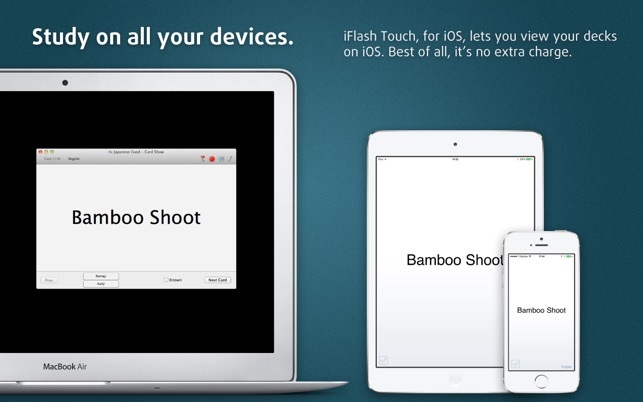 But if you want to export your card decks to an iOS device running iFlash Touch? Good luck. Indeed, can the process to do this be worse? The app indicates that all you have to do is make sure that the Mac and the iOS device are on the same wi-fi network. Yeah? Right. That depends on how your network is configured, and not everyone's network is configured the same. It's clear that they didn't test this function much and it apparently requires Bonjour, but even with that service enabled, I can't get the two to connect. Loopware needs to vastly improve this feature drastically, making it more intuitive and compatible. The easy ways would be iCloud Drive and/or DropBox compatibility, along with the ability to load decks via iTunes. Why they chose not to do this is not only disappointing, it's also unbelievable. Its a great app but could be improved. I wish I could automatically divide my vocabulary desk into parts. I need this so I could review few parts at a time before moving to the next group of words. For example, I have 5000 vocabulary words I wish theres a button to group it by 30 vocabulary words each group. This way I could focus on smaller group (I.E memorizing the whole group) before going to the next group. The current version is its just one whole deck. I know you guys will do this in the future. i trust this app.